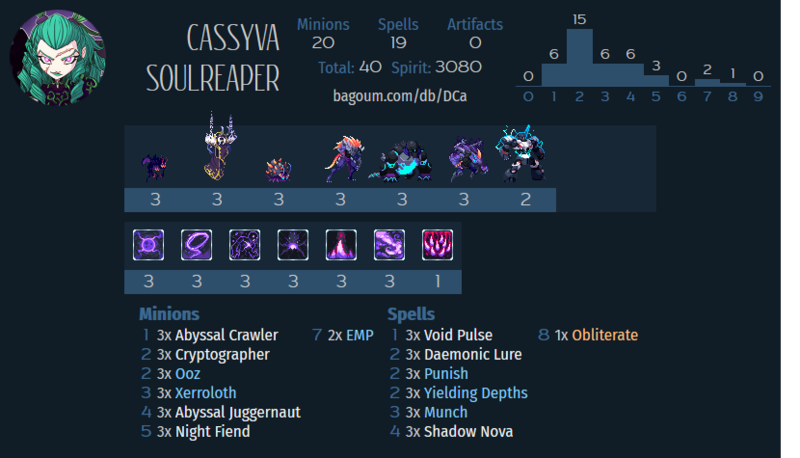 Cassyva is a tough one, essentially you need legendaries to justify running her; Desolator in Aggro to reuse them interactively off her BBS, Obliterate or Azalea to use her creep generation. Other win conditions just suit other generals better, and a control deck without any game winning legendaries I feel would be far too weak to justify. In the end I decided that It’d simply be best to give people a deck that shows the creep theme of Abyssian and Cassyva, I think creep intrigues a lot of people and having a good place to start building from is quite nice even though I can’t truly recommend that a player start on Creep if they are budget restricted. If you’re playing at lower ranks then this should be a reasonable taster of what Creep is and does, don’t expect to climb easily to the top ranks with this though. Due to budget restrictions there’s only one copy of Obliterate, so I’d recommend crafting a Ghost Azalea to back it up ASAP (you can also run the deck with Azalea if you open one in which case add the Oblit asap instead). That all said it’s very much a control that looks to go into lategame anyway, so if you are replacing every turn and casting removal you should be getting to cast it at least some of the time. It’s not totally necessary to draw Obliterate to win either, as Abyssal Juggernauts are threats large enough to win the game when unanswered, though this is more difficult to pull off. Aside from that there’s a bunch of removal and creep generation, some of it comes at quite a tempo deficit, that you look to recoup later with your payoff cards like Munch, Juggernaut, Night Fiend and of course Obliterate. These are the main payoff win conditions for spending our cards and mana ditzing about generating creep. Juggernaut is just a big fat minion that dies to single target removal, dispel and enough damage from enemy minions too. It’s usually fine early with just a few creep if you play it somewhat defensively it will threaten to grow every turn, but it shines a little more as the game goes on becoming very large while still staying cheap to cast. It can grow really quite large in the right circumstances and not every deck is equipped to be able to immediately deal with it. Don’t try and win the game off your first medium sized one unless you’re already in a very strong position, but make smart trades and positioning with it to get value from it. Once it gets large just send it in with a little more abandon to get use of it before it eats a removal. Obliterate is the real win condition that you hope to draw, and does what it says on the tin. It’s totally not usable early though, so replace it away in most situations before 6 mana, there is some decent draw in the deck and you will need immediate power to navigate the midgame of some of the scary decks in the midgame. It does clear all your creep off the field though, so if you don’t win with it a lot of your cards are now back to being very weak. It’s a finisher, but often clearing the board and setting them very low is enough to get you there, so it’s not as though you can only cast this to set your opponent to 0. It should though be the big turn where all your hard work pays off, but if you have to cast it st stay alive, then do what you gotta do. The main thrust of our creep generation comes from our early game minions and BBS. Crawlers is great as a low investment threat that generates value every turn, your opponent will likely have to waste equal resources to deal with it. Ooz is a great little boy, send it in early to hit up your opponents board and generate creep. As a Bettle pet your opponent will have a lot of options to counterplay it, but for 2 mana you’ll usually get a satisfactory result off of this. Also a small trick you can do is to ping it with your own BBS, which won’t often come up as relevant, but is useful to know. Cryptographer is stronger if you were running mentor, but gives us a little bit of extra damage to clean up boards or git multiple targets such as eggs and whatnot to generate more creep while clearing a board. I really don’t like Shadow Nova, 4 mana for such a small immediate impact, but the deck does need something that’ll generate a decent amount of creep, and other options like Painful Pluck or Sphere of Darkness are equally low impact, the trade of producing less is they cost less. Nova at least gives you total freedom on the placement and the 4 creep it provides immediately make all your payoff cards now actually usable by itself, so it gets the nod. If you go into higher rarities I think Klaxxon is much better, but that is for the upgrades section. These are the other reasons included in the deck to be running creep, each with some benefit for having the tiles in play. Unlike the Jugg & Oblit there are not the win conditions, but the utility cards and removal that should keep the deck going while it tries to get into a winning position. Night Fiend is like a bigger, one sided, but conditional Skorn. It should help to deal with swarms and small minions like eggs, wraithlings and heartseekers, even when they are buffed by Wanderer,m as well ans chip down the HP of the enemy general and their larger minions. The conditionality of it is a real worry though, but on the plus side it’s very rarely seen so your opponent probably won’t be deliberately playing round it in most cases. Munch is the big single target removal spell that can bring you back from the brink by healing you up nicely. It need a reasonable amount of creep and a good target to be of most use, but when you Munch a juicy target it’s quite a feel good moment. Yielding Depths brings some much needed digging power to the deck, with only 1 Obliterate we definitely need some draw if we want to cast it. Also the deck does use a fair number of low cost cards, so refilling our hand a little for quite a low cost is a good thing to have access to in the lategame. Punish and Cassy go together perfectly, for 3 mana you kill the target and get a creep tile. It’s clean and efficient and deals with a single threat very nicely. Lure is an Abyssian Staple, being a cheap way to get a minion out of the problem zone and make it not a problem for a few turns. Also if you have a creep tile unoccupied you can often Lure a unit onto a creep tile in order to deal 2 damage to it, 3 if you add on your BBS, this is often enough to deal with small or damaged units, or combine with an attack to get enough damage off if that suits your needs better than simply sending it to a corner. I quite like this card, it’s not super broken or anything by any means, but it can offer a nice bit of card advantage and will refill your hand in the right scenarios. the 2 mana 4/4s are very much cost efficient and can either be cast or replaced depending on your needs. Xerroloth is a fragile but potent backline value generator which can bring you back to even on board or on hand size in a game. It doesn’t have any particular synergy with the gameplan, but is a nice addition to a control deck like this. EMP is good and has been included in a number of my budget lists for it’s ability to be an answer and a threat in one large package. The global dispel catches a lot of threats that some of the other answers in the deck may miss and generally EMP makes your opponent sit down and stops whatever unfair thing they’re doing. The nice thing is it doesn’t hit tiles, so we still get to keep all our creep when we slam this down to reset most other aspects of the board. One of Abyssian’s most efficient spells. Staying alive can be a little difficult, but the healing that Void Pulse brings goes a little towards remedying that. The damage chips away at the enemy general which can help to bring them into range for Obliterate and damages artifacts and such. For 1 mana it’s easy to squeeze this in, but if you feel like a 2 drop like Azure Herald or even something like Spectral Blade could bring more then that could be a reasonable switch to go for. This deck needs upgrades. I think the first thing I’d go for is a Ghost Azalea, it operates similarly to Obliterate in it’s capacity to do huge game-ending face damage, but comes down earlier and won’t clear all our creep when cast. Klaxxon I believe to be one of the better ways of generating creep as the 6/6 provoke can do a lot to protect you, though it is weak to trasform and dispel, I think 2 is a good number. Bloodbound Mentor is a possible option for creep generation or card advantage. A second copy of Obliterate would not go amiss. Desolator is exceptionally good. cards like Spectral Blade, Kron, Nethermeld, Pluck, Sphere and more are all options. I have also seen some people do Dying Wish packages with Carrion/Lurking Fear or even Reliquarian. Feel free to explore and see what other players are trying.